You can depend on B-One Construction for a wide range of quality construction solutions. We are a full-service general contractor that can handle both commercial and residential projects, specializing in remodeling and new construction. We have been serving home and business owners, architects, and designers in Los Angeles and surrounding areas for more than 42 years. Over time, we have mastered the steps to ensuring quality in each job entrusted to us. We take pride in our work, and this shows in the exceptional results we deliver and our award-winning projects. We build customers projects as if we were building them for ourselves with intensity and personal attention. B-One Construction focuses on new builds, remodels, and property improvements. We work closely with you throughout the process so we can better understand your unique needs and deliver top-notch outputs. Our expert team will make your dream home a reality. Get in touch with us today and learn more about how we can do it. Thank you for the quick and professional job. It looks wonderful and we are getting a lot of compliments. 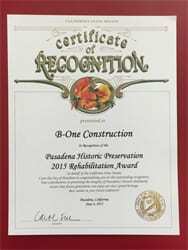 I have now worked with B-One construction on two major remodeling/addition jobs done to my Glendale property. They have always been reasonably priced and have produced a good end result. No construction project goes without problems and Bob was always on hand to keep the project moving forward. I would use B-One again and I am fully comfortable to recommend them as a professional construction company. We were very impressed by Bob’s honesty, integrity, and work ethics. His expert ideas contributed significantly to enhancing this lay-out of our dental office. The 3,000 sq. feet that he designed, and constructed is extremely functional and beautiful. We recommend B-One Construction, as we have done in the past, without any hesitation. 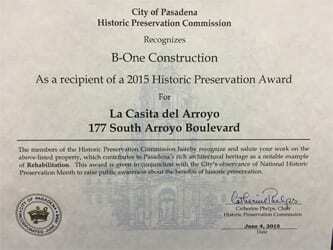 Onyx Architects recently worked with B-One Construction on two significant Pasadena historic rehabilitation projects. In addition, B-One completed a rehabilitation of a historic structure used as a city senior center. All projects were bid competitively, two as a single prime contract, the second as multiple bid packages. One selection criteria was the importance of implementing craftsmanship and strong attention to detail to create a successful project. B-One was always proactive in thinking ahead so that the projects moved smoothly and met schedules and deadlines. All of our projects have had very low change order costs, often due to B-One's proactive project management. As advances in technology have influenced our industry toward mass production, B-One employs these new resources to create a carefully crafted and diligent result. Onyx has forged a great working relationship with Bob Oundjian and his team, and we look forward to producing many more beautiful projects with B-One in the future. I have worked with Bob Oundjian, owner of B-One Construction since 2004. He was the contractor for the residential project we designed in Los Angeles. He did a terrific job on time and on budget. The home owners’ were very pleased. B-One Construction was the contractor on three other residential projects we did, in Pasadena and Burbank with the same wonderful results. Every project came in on time and on budget. There is always a neat construction site which is a mark of a contractor who cares about his work. Bob follows and understands architect’s plans. If he finds something that may become a problem in the construction, he notifies the architect well in advance so that there is time to resolve the problem. Recently I did a project for First City Credit Union. They wanted the job done “Turn-Key”, in other words Design-Build. I turned to B-One Construction to build what I designed. Once again the project was a success and B-One Construction did a wonderful job and they followed the plans to a T. Over the last 9 years I have always found Bob Oundjian to be honorable, trustworthy and ethical. Words cannot overstate how impressed we were with Bob and B-One Construction. When we decided to do an addition on our house, friends bombarded us with contractor horror stories. But from day one Bob shattered stereotypes and far exceeded our expectations. From the littlest details to larger decisions, Bob guided us through the daunting process with ease, professionalism and a great sense of humor. His work ethic was exhibited by always being on time and on budget – he even finished our project a month early! Though Bob personally oversaw most of the project (he met us to shop for everything from windows to tiles, everyone on his crew was impressive as well – they always took pride in their work and were true craftsmen. Even when the project was finished, Bob did not stop caring about his work. Months after we were back in our house, he stopped by to make sure everything was still up to par and if something fell through the cracks (which was few and far between), Bob fixed it with no hesitation. We trusted him so much that we already contracted him for another project. If you’ve been searching for a contractor, you must stop right now and hire Bob. It was one of the best decisions we ever made. 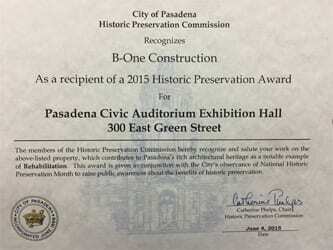 Contributions in preserving the integrity of Pasadena’s historic landmarks. 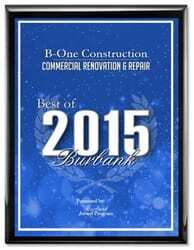 BURBANK June 8, 2015 — B-One Construction has been selected for the 2015 Best of Burbank Award in the Commercial Renovation & Repair category by the Burbank Award Program. Each year, the Burbank Award Program identifies companies that we believe have achieved exceptional marketing success in their local community and business category. These are local companies that enhance the positive image of small business through service to their customers and our community. These exceptional companies help make the Burbank area a great place to live, work and play. Various sources of information were gathered and analyzed to choose the winners in each category. The 2015 Burbank Award Program focuses on quality, not quantity. Winners are determined based on the information gathered both internally by the Burbank Award Program and data provided by third parties. The Burbank Award Program is an annual awards program honoring the achievements and accomplishments of local businesses throughout the Burbank area. Recognition is given to those companies that have shown the ability to use their best practices and implemented programs to generate competitive advantages and long-term value. The Burbank Award Program was established to recognize the best of local businesses in our community. Our organization works exclusively with local business owners, trade groups, professional associations and other business advertising and marketing groups. Our mission is to recognize the small business community’s contributions to the U.S. economy.